Activities of Daily Living is a common healthcare term that refers to everyday self-care tasks such as dressing, bathing, eating, and going to the toilet. These devices can help you remain more independent. 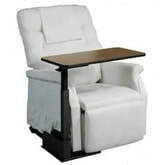 If you are purchasing a lift chair recliner with help from Medicare, you will need to purchase it through a local DME provider that participates in Medicare. ​​If you decide to purchase one on your own—without receiving any reimbursement from Medicare—look for a lift chair recliner at Sam's Club, a lift chair recliner on Amazon, or visit your local furniture store. Lift chair recliners typically cost between $300 and $500. If you have a medical prescription for a lift chair recliner, Medicare will reimburse roughly $300, which covers the motor mechanism within the chair. Many people choose to not go through the reimbursement process and either buy them outright or borrow them. If you have upper extremity weakness and trouble getting up and down from a couch or chair, a lift chair recliner can help you conserve energy. Always check with your physical therapist to make sure it is safe for you to use. Button hook / zipper pulls typically cost between $10 and $15. Medicare does not cover them. Medicaid and private insurance typically do not either. If one is not available from a loan closet, you will need to pay out of pocket. 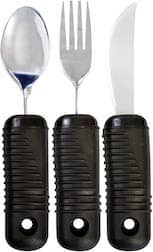 Built-up utensils typically cost between $10 and $15. Medicare does not cover them. Medicaid and private insurance typically do not either. If one is not available from a loan closet, you will need to pay out of pocket. Reachers are available in a variety of stores such as Walgreens and CVS. Reachers typically cost between $10 and $20. Medicare does not cover them. Medicaid and private insurance typically do not either. If one is not available from a loan closet, you will need to pay out of pocket. Universal cuffs typically cost between $10 and $35. Medicare does not cover them. Medicaid and private insurance typically do not either. If one is not available from a loan closet, you will need to pay out of pocket. Universal cuffs are available in small, medium, and large. Wheelchair ramps typically cost between $115 and $250. Medicare does not cover them. Medicaid and private insurance typically do not either. If one is not available from a loan closet, you will need to pay out of pocket.